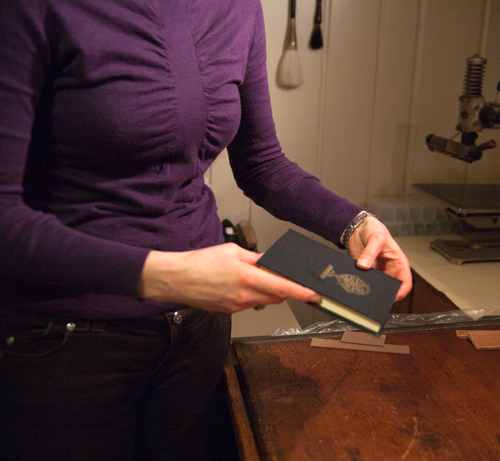 When we toured Katie Wagner’s home bookbinding and book restoration studio a few week’s ago, we promised a tutorial of Katie’s process for binding a case-bound book — a hard-bound book with a covered spine. 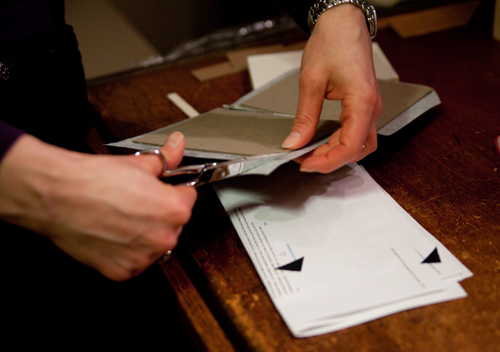 This how-to shows that it is indeed possible to bind books the old-fashioned way. She makes it look really easy. 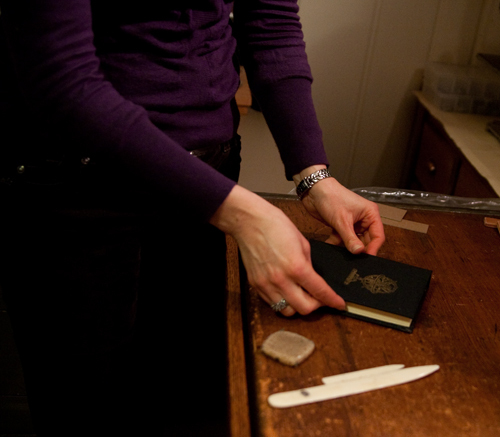 Katie first cuts the thick binder’s board to make the cover, back and spine. 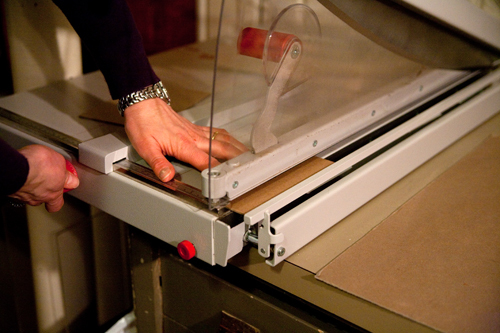 She uses a board shear, which is essentially a paper cutter with a much thicker blade and ability to evenly cut .82 inch board. She brushes acid-free glue on one side of the binder’s board and carefully secures it to the decorative outer cover, which can be anything from imitation leather to suede or starched linen, leaving about 3/4 inch overlap. Then she uses bone folders to measure the distance between the center spine and the outer covers. 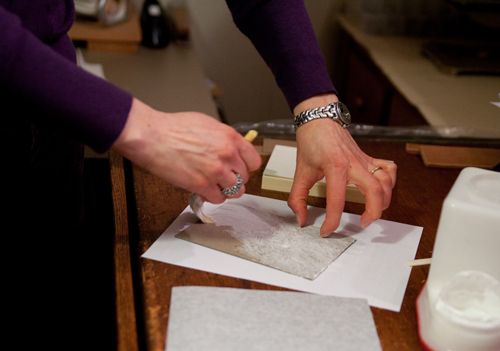 Katie cuts the corners of the decorative paper at an angle to allow for a neat fold, then carefully folds the excess paper down onto the binder’s board. For the purposes of our demonstration, Katie had a pre-made text block (the inner paper) already sewn and ready to be cased in. 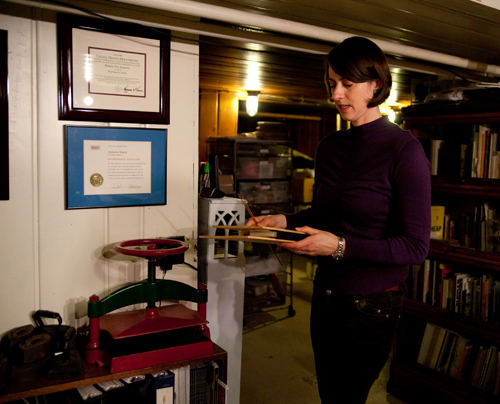 She says you can sew it yourself, but she bought the pre-made one from Hollander’s, a store specializing in hand bookbinding supplies and fine papers. 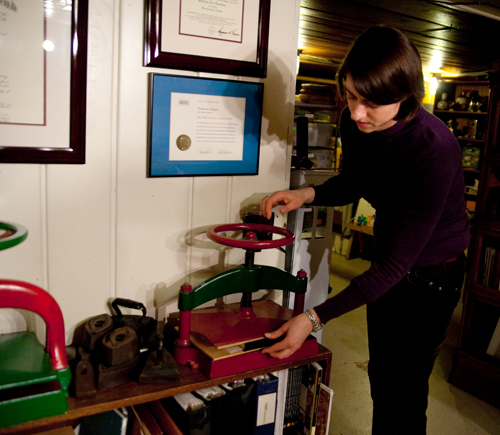 You can also buy them from TALAS, which specializes in bookbinding supplies geared toward conservation and restoration. You can’t see in this photo, but after folding the book together with the text block in between and glued to the cover, she puts knitting needles on either end of the spine to create a bit of space, or give, for the binding. And puts the book into a cast iron press to allow the glue to dry for a few hours and to allow everything to flatten nicely. 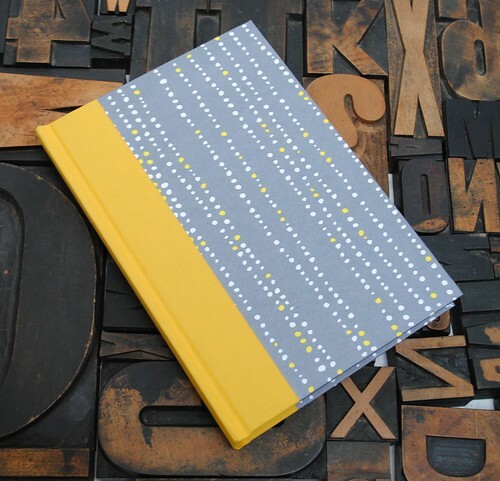 When it comes out, a beautiful handmade book will be ready for a lucky recipient. 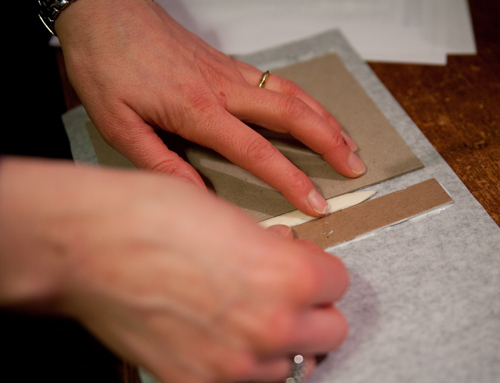 To learn from Katie in person, you can sign up for her class in this type of case-bound bookbinding starting in April through the Smithsonian Associates.